It's been another wild season in the NBA's Western Conference. As of this afternoon, three teams (Houston, Portland, and San Antonio) have the exact same record; each could possibly finish anywhere from No. 2 to No. 5 in the postseason seedings. And the Denver Nuggets are just one game ahead of those three. What's more, three other clubs (the Hornets, Mavericks, and Jazz) are battling it out to see who can avoid the dreaded eighth seed that comes with a first-round bout with the Los Angeles Lakers. The Jazz are currently in eighth as they go into tonight's game against—you guessed it—the Lakers. All eight Western Conference Playoff teams are meeting another in the group in the next two days, and several of these upcoming contests could serve as a possible first-round matchup previews. It's been a relatively disappointing season for the Jazz. The campaign has been marred by injuries since before games were even being played. Almost the entire roster has missed at least some time due to injury, but most significantly, All-Stars Deron Williams and Carlos Boozer have both missed time. 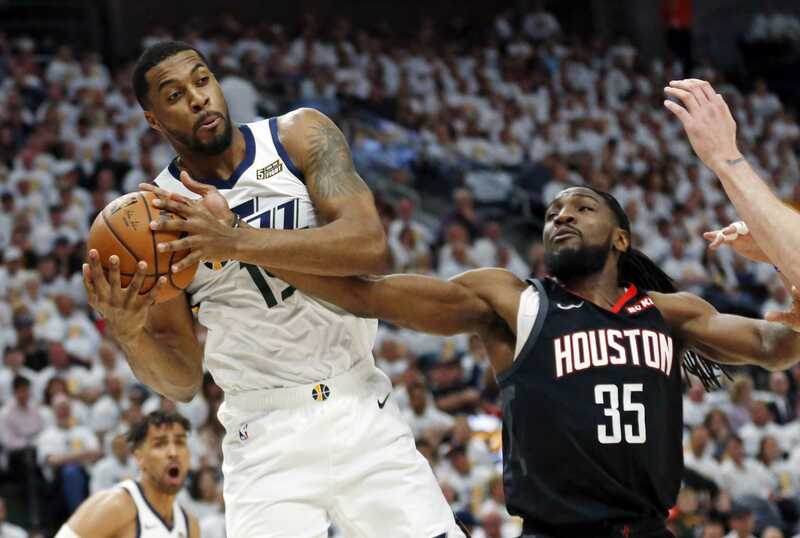 While Paul Millsap and Ronnie Brewer have improved to pick up some of the slack, it hasn't proven to be enough so far to pull the Jazz out of the No. 8 spot. Tonight they face a very rough task: going to Los Angeles on the second half of a back-to-back to play the best team in the Western Conference. While the game doesn't appear to mean much to the Lakers, who have had the top seed in the West locked up for a while now, it appears as though head coach Phil Jackson intends to play his full rotation in an effort to gain a mental edge should the two teams face each other in round one. If the Lakers come out and play as they normally do, it'll be very tough for the Jazz, especially considering their consistently woeful performances against winning teams on the road. If the Lakers win, the Jazz will be stuck in eighth to face the same team in the first round, regardless of what happens to New Orleans or Dallas tomorrow night. Both the Hornets and Spurs have been going through tough times recently, and both teams can attribute their struggles (at least a little bit) to the injury bug. It's no secret that the Spurs (53-28) will be playing the rest of the way without star reserve Manu Ginobili, who has been forced out of action for the remainder with a stress fracture in his right fibula. While they're 6-4 in their last ten games, the Spurs haven't looked at all like a team that has won four championships in the past ten years. While Roger Mason has come in and filled in somewhat well for Ginobili, a large portion of the team's success came from Ginobili's uncanny ability to knife through the lane for easy baskets. Still, you can never count out a Gregg Popovich team once the postseason rolls around, especially with Tony Parker playing as well as any point guard in the league today. The tandem of Parker and Tim Duncan is still one of the most formidable duos in the league today, and they're proven winners. The Hornets are another team that has had their season at least derailed by health concerns. Their most noticeable hole is in the middle, where Tyson Chandler has missed significant time this year with ankle problems. That leaves the Hornets without a superior post defensive presence to stop easy penetration from opposing guards. The 7'1" Chandler is an elite athlete and shot-blocker, and without him, the New Orleans defense has suffered. And while the addition of James Posey has given the Hornets some viable depth off the bench, he's had a bit of a rough year shooting the ball at just 36 percent from beyond the arc this season. Sharpshooting Peja Stojakovic is another player that has had injuries slow him down; he's been battling a bad back and was just recently re-inserted into the lineup. These things being said, superstar point guard Chris Paul is having another stellar season, and David West has regained his form after missing time earlier this season. As long as those two are healthy, the Hornets are still a decent threat to pretty much anybody in the Playoffs. By the time the game between New Orleans and San Antonio begins, the Hornets will know whether or not they will be battling to stay out of the eighth spot. This could be a factor in how they play, as nobody wants to play Los Angeles in the first round. San Antonio just got two wins against the lowly Kings (in rather dubious fashion) and Warriors, and is now trying to reassert itself as an elite contender by the time the "second season" begins this weekend. Add the Rockets and Mavericks to the list of teams in the West that have been able to stay afloat despite a rash of injuries. Houston has made its run to the top of the Western standings without former scoring champion Tracy McGrady, and the Mavericks have vaulted themselves into the postseason despite missing Josh Howard and Jason Terry for periods of time. If Utah ends up losing to Los Angeles Tuesday night, it's likely that this game will mean more for the Rockets than their opponents. A Houston win over Dallas coupled with a Portland win over Denver would sli[ the Rockets into the coveted second seed, which is good for home-court advantage through the first two rounds of the Playoffs as well as a division championship. Dallas' one real hope is to avoid playing Los Angeles in the first round. Other than the absence of McGrady, the Rockets will be heading into the Playoffs with a fully healthy roster. All-Star Yao Ming has put together another quietly great season, averaging just under 20 points, 10 rebounds, and two blocks a night. He's flanked by the increasingly reliable Luis Scola and defensive-minded wingers Shane Battier and Ron Artest. They look increasingly dangerous andgo into the postseason as one of the deeper teams in the Western Conference, even without McGrady and former starting point guard Rafer Alston. The Mavericks, despite a close win at home over the lowly Timberwolves Monday night, appear to have hit their stride under first-year coach Rick Carlisle and could be going into the postseason playing their best ball of the season. They boast strong veteran leadership with the likes of Jason Kidd, Dirk Nowitzki, and Jason Terry. Nowitzki is enjoying one of the better seasons of his career, averaging almost 26 points and eight rebounds per game. He's quietly been one of the most consistent players in the association this season, at times keeping his club alive all by his lonesome. In a critical game at Phoenix last month, he hit several big shots down the stretch to lead Dallas to a critical victory, all but cementing their spot in the Playoffs. While there are still questions about depth, the Mavs present a tough matchup for anybody in the West, but if the game turns out to mean more to the Rockets in terms of seeding, look for them to come into Dallas and take care of business. The Nuggets and Blazers are two teams that hardly anybody predicted would be fighting it out near the top of the Western Conference in mid-April, but that's right where they find themselves now. Since trading Allen Iverson to Detroit in exchange for Chauncey Billups, the Nuggets have gone from a high-scoring team that doesn't play any defense to a high-scoring team that plays decent defense. Denver ranks second amongst all Playoff teams in scoring per game at just under 105 points per. They currently hold second place in the Western Conference due to the great seasons of Billups and Carmelo Anthony combined with the resurgence of Nene and the emergence of JR Smith and Chris Andersen off the bench. Smith erupted for 45 points on 11 three-pointers in Monday's crucial victory at home over Sacramento, and Andersen, in just about 20 minutes per game, is averaging almost three blocks and six rebounds a night. Andersen's defensive play has made the Nuggets' trade of fellow shot-blocker Marcus Camby to the Clippers this past offseason look like a smart move. But while it's been a magical season for Denver to this point, they're not quite out of the woods yet. The Portland Trail Blazers have gone from "future title contender" to "legitimate title threat" in just a year. Third-year guard Brandon Roy has already become an All-Star and has the makeup of a player capable of leading his team to victory time and time again. The 6'6" guard is averaging just under 23 points and six assists a game, and, though just 24 years old, has already become an elite NBA player. Around him, Blazers GM Kevin Pritchard has assembled a group of young players that fit very well together and all share the desire to win as soon as possible. Power forward LaMarcus Aldridge is another rising star, along with Rudy Fernandez and Travis Outlaw. Portland's two centers, Joel Pryzbilla and former No. 1 overall pick Greg Oden combine to form a nice couple of anchors in the middle of the defense. Portland has won five straight and nine of their last 10 and are looking to send a message to their division rivals tomorrow night. The 2008-09 season has been one of the more unpredictable seasons in league history in terms of the standings, and it's going right down to the wire. Don't be surprised if some of these matchups wind up being previews of some of the first-round Playoff series.